Wish you all a Happy Ganesh Chaturthi. Finally the days of Ganesh Chaturthi has begin. We are all are exciting to bring Lord Ganesh at our home by singing a song "Bappa Moreya re Bappa Moreya re". Yes this is the song we sing when we bring Lord Ganesha at our home. On this auspicious period, people worship Lord ganesh idol for 1 day, 3 day, 5 days and sometimes for 11 days. These days are celebrated by performing puja, preparing delicious dishes and bursting of crackles. The sweets which is most liked by Lord Ganesh is Modak. Every home in these days prepare varieties of modak. This day brings out the fun and happiness in the home. This year we are going to celebrate Ganesh Chaturthi at my mother's home. Mom has prepared many kinds of sweets like ladoo, karanji, chakli etc. On my behalf I thought to prepare these anjeer barfi to offer to god, which will be little different from all those traditional sweet. Anjeer barfi are very simple to prepare. 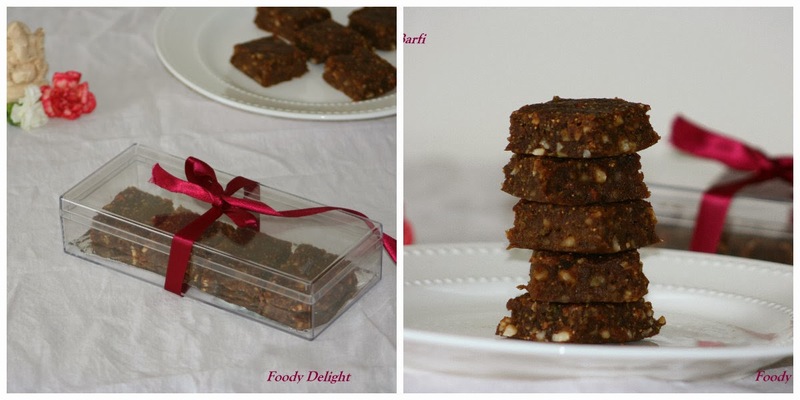 These barfi includes some dates to bring the natural sweetness and some nuts that give crunchy texture in every bite. So lets see how to make this anjeer barfi. Soak the anjeer in warm water for 30 minutes. Chop the cashew nuts, dates and almonds into small pieces. Also you can make coarse of these by ptting them into food processor. Be careful do not powder, because you need that nutty texture in your barfi. Strain the anjeer and take out all the water by pressing it with kitchen towel. Heat the ghee on medium flame and add the anjeer paste. Saute for few minutes. Add chopped nuts and dates. Mix well and cook until all the ingredients binds with each other. Also add cardamom powder and nutmeg powder. Mix well and cook for another 1 minute. Line the plate with parchment paper or butter paper. Transfer the barfi mixture in the lined palte and level it evenly on all the sides. Allow the mixture to cool down completely. Then cut the anjeer barfi in your desired shapes.